After sailing through space for more than 10 years, the ESA’s Rosetta spacecraft is now less than a week shy of landing its robotic probe, the Philae lander, on a comet. Touchdown should be Wednesday, Nov. 12 at 7:35 a.m. PST. A confirming signal is expected within 30 minutes. 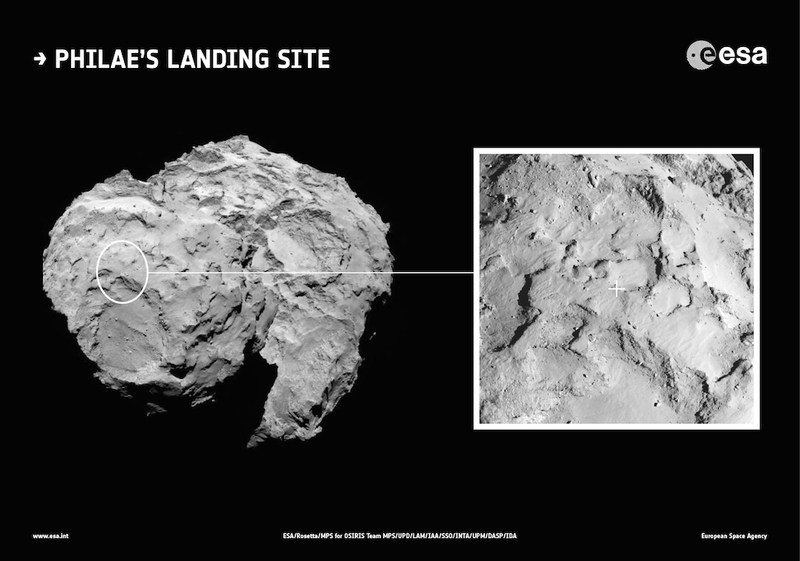 If all goes as planned, it will be the first-ever soft landing of a spacecraft on a comet. The landing site, f/k/a “Site J” is now officially named Agilkia, chosen after an ESA public essay competition. Agilkia refers to an island on the Nile where ancient buildings were relocated after the island Philae flooded. One hundred fifty people nominated Agilkia, including the overall winner, Alexandre Brouste from France. Alexandre has been invited to watch the landing activities at Rosetta’s mission control in Darmstadt, Germany. After touchdown, the lander will obtain the first images ever taken from a comet’s surface. It will also drill into the surface to study the composition, and witness close up how a comet changes as its exposure to the sun varies. Its mothership, the Rosetta spacecraft, will remain in orbit around the comet through 2015. The orbiter will continue detailed studies of the comet as it approaches the sun and then moves away. Gallery | This entry was posted in Science and tagged 67P\/Churyumov–Gerasimenko, European Space Agency, Philae, Philae (spacecraft), Rosetta (spacecraft). Bookmark the permalink.